For a long time, the Spiegel Bestseller List published the only German bestseller list. Now, Bild and Amazon are cooperating to bring a new player to the game. In December 2015, Germany’s Bild newspaper and Amazon Germany announced a cooperation to offer a new bestseller list for fiction and nonfiction that will include traditional and self-published books, as well as multiple book formats. 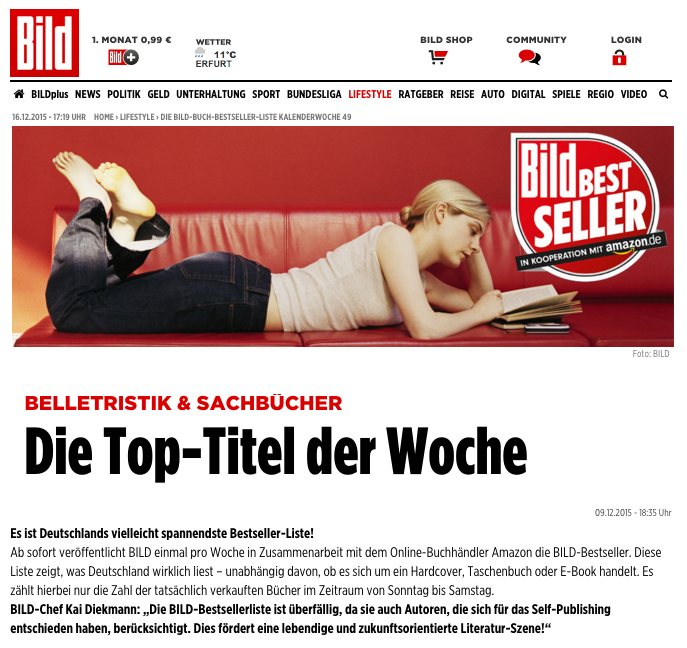 This list is published weekly — on www.bestseller.bild.de every Wednesday evening and in the Thursday print edition. Bild is a German tabloid newspaper with a daily print run of 2.8 million copies and over 16 million monthly unique visitors to its website. It was first published in 1952 and is owned by the Axel Springer Verlag, one of Europe’s biggest media companies with a sales turnover of 3 billion euros in 2014. All information the bestseller list comes from Amazon.de, using a sales period of Sunday to Saturday and including sales in every format for each title — hardcover, paperback, ebook. Audiobooks and books read via Kindle Unlimited are not part of the new Bild bestseller list. However, all German books will be counted, including self-published titles and traditionally published books. Two lists will be published: the Top 20 Fiction and the Top 20 Nonfiction. While the online version on bild.de will feature all titles (including a “click to buy” link to Amazon, only the Top 10 titles from both lists will be available in print.